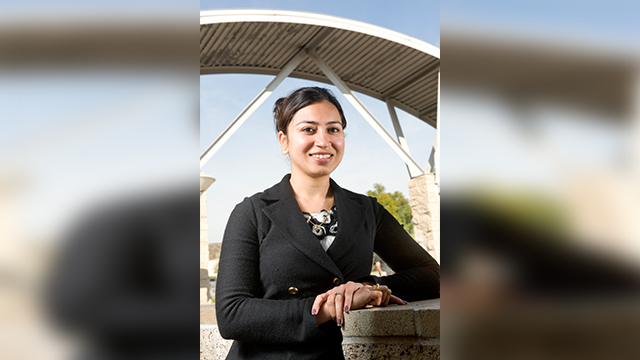 Neha Singh, associate professor at The Collins College of Hospitality Management. The Collins College of Hospitality Management has come a long way since 1973, when it began as a program in the College of Business Administration. Its growth has been fueled in large part by the generosity of donors. When the college’s assistant and associate professors learned of the faculty/staff giving campaign, they came together to show their support in a big way: 100 percent participated. Associate Professor Neha Singh, another of the donors, says supporting the campaign is a good investment. The official campaign continues through April. To see some of those who have made supporting the university a part of their lives, visit bit.ly/1gGJMTo. To make a donation via payroll deduction, visit http://www.cpp.edu/~advancement/forms1/cd88-fill.pdf for the form. For questions about the campaign, call Dolores Ybarra, director of the Annual Fund, at (909) 869-4970.